Kick off your visit on the 15th (Fri): skim along the rocks with a canyoning and rapelling tour, then take in the dramatic scenery at Wentworth Falls, and then make a trip to Echo Point Lookout. To find maps, other places to visit, traveler tips, and more tourist information, read our Katoomba holiday planner . Hyderabad, India to Katoomba is an approximately 19.5-hour flight. The time zone difference moving from India Standard Time (IST) to Australian Eastern Standard Time (New South Wales) (AEST) is 4 hours. Expect little chillier temperatures when traveling from Hyderabad in March; daily highs in Katoomba reach 31°C and lows reach 19°C. Finish your sightseeing early on the 15th (Fri) to allow enough time to drive to Sydney. On the 16th (Sat), admire the natural beauty at Royal Botanic Garden Sydney, then see some colorful creatures with a scuba or snorkeling tour, then trek along The Opera House to the Botanic Gardens Walk, and finally wander the streets of The Rocks. You can drive from Katoomba to Sydney in 1.5 hours. Alternatively, you can take a train. March in Sydney sees daily highs of 30°C and lows of 22°C at night. Wrap up your sightseeing on the 16th (Sat) to allow time to travel to Gold Coast. Start off your visit on the 17th (Sun): observe the fascinating underwater world at Sea World Theme Park and then get in on the family fun at Infinity Attraction. 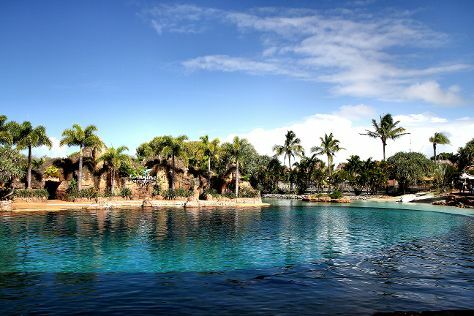 For more things to do, reviews, where to stay, and more tourist information, use the Gold Coast day trip planner . Traveling by flight from Sydney to Gold Coast takes 3.5 hours. Alternatively, you can do a combination of flight and train; or drive. In March, daytime highs in Gold Coast are 32°C, while nighttime lows are 23°C. Finish your sightseeing early on the 17th (Sun) so you can drive to Brisbane. Kick off your visit on the 18th (Mon): identify plant and animal life at Lone Pine Koala Sanctuary, then get great views at Mount Coot-tha Lookout, and then find something for the whole family at Wheel of Brisbane. Drive from Gold Coast to Brisbane in an hour. Alternatively, you can take a bus; or take a train. In March, daytime highs in Brisbane are 32°C, while nighttime lows are 23°C. Finish your sightseeing early on the 18th (Mon) to allow enough time to travel to Port Douglas. On the 19th (Tue), see some colorful creatures with a scuba or snorkeling tour. To find where to stay, photos, traveler tips, and tourist information, use the Port Douglas route website . You can do a combination of flight and shuttle from Brisbane to Port Douglas in 6 hours. Alternatively, you can do a combination of bus, flight, and shuttle; or drive. Traveling from Brisbane in March, plan for somewhat warmer nights in Port Douglas, with lows around 27°C. Finish your sightseeing early on the 19th (Tue) so you can drive to Cairns. On the 20th (Wed), discover the deep blue sea with a scuba or snorkeling tour. To find reviews, where to stay, other places to visit, and other tourist information, use the Cairns attractions app . Traveling by car from Port Douglas to Cairns takes 1.5 hours. Alternatively, you can take a bus; or take a shuttle. Expect a daytime high around 36°C in March, and nighttime lows around 27°C. Wrap up your sightseeing by early afternoon on the 21st (Thu) to allow time for travel back home.